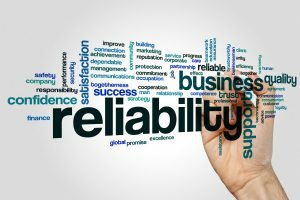 The Relyence Dashboard provides a concise, visual overview of your quality and reliability metrics allowing you to quickly assess system health. 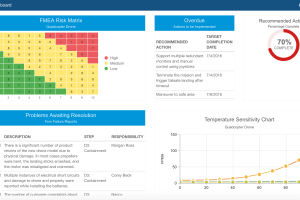 Combining cross-module analytics, the Relyence Dashboard offers the ability to monitor all your quality activities at a high level, while providing drill-down capabilities for in-depth review. Relyence Example Dashboard can be viewed any time by selecting Welcome to Relyence from the Help dropdown menu in the upper right corner of the Relyence header bar. This will bring up the “Welcome to Relyence” dialog. Select the module you are interested in from the left set of tabs, and then click Open Example Dashboard. For all Relyence Example Dashboards, a set of random sample data is used. Each element on the dashboard is referred to as a widget. Widgets can be tables or a variety of charts, such as pie charts, line graphs, bar graphs, and gauges. Any widget on the Dashboard can be maximized for full-screen viewing. To maximize a widget to full-screen, hover your mouse over the upper right corner of the widget title bar until a small double arrow icon – the Maximize/Minimize icon – appears. Click on this icon and the widget will toggle between full view and minimized view. In some cases, dashboard widgets may be easier to read when maximized to full-screen. This is especially true when a widget encompasses a lot of data. Another highly useful feature of Relyence Dashboards is the ability to drilldown. Drilldown enables you to view the underlying data presented in the chart or table in a particular widget. For example, in a FMEA Dashboard that includes the Top 10 RPN widget, you can click on any row in the list and you will automatically be taken to the appropriate FMEA to the exact row on the Worksheet containing the data with the given RPN. Relyence Dashboards are completely customizable. You can create any number of your own Dashboards and use them to get an overview of your system information. You may use Dashboards to highlight critical Analysis data, analyze metrics, or simply to have a compact visual overview of Analysis data. You can start either with a completely new dashboard, or create a new one based on existing dashboard and make modifications as needed. Relyence is pre-packaged with a set of sample Dashboards that can be used as a starting point and then easily customized to suit your needs. When creating a new Dashboard in Relyence, click the Template dropdown to access the available Dashboard templates. 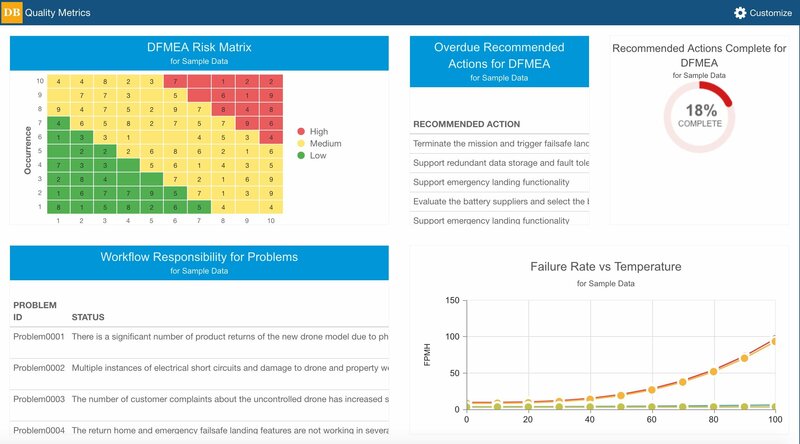 To create a Dashboard using one of the Relyence built-in examples, choose the FMEA, FRACAS, Fault Tree, or Reliability Prediction Example Dashboard from under the Examples section in the dropdown list. You can also select the “Example Dashboard – All Modules” if you want to start with an example dashboard that includes data from all Relyence modules. To create a completely new Dashboard, select “Empty” from the Template dropdown list. When a Dashboard is initially created, you will be taken directly to the Dashboard Editor to begin the process of customizing your Dashboard. To access the Dashboard Editor any time a Dashboard is active, click on the Customize button in the upper right corner. The Dashboard Editor is used to create your Dashboard using a drag-and-drop interface to drag widgets onto your Dashboard. Available widgets are shown in the Widget Pane on the left of the Dashboard Editor. For organizational purposes, widgets are grouped based on the Relyence module they are associated with, and an additional General group that includes widgets that apply to all modules. You can mix and match widgets of any type on your Dashboard; they are grouped simply for organizational ease when building your Dashboard. Simply click the expand arrows in widget sections to view all available widgets. Drag the widgets you would like on your Dashboard canvas. Once a widget is placed, the “Properties” dialog will appear to allow you to customize the widget properties to you preference. For example, you can set the widget title, the data to be used in the widget, as well as various additional properties that vary depending on the selected widget. You can go back and edit the widget properties at any time by clicking the Properties icon in the upper right corner of the widget. You can customize the height of the rows in your Dashboard, as well as the width of the widgets, using the plus (+) and (-) icons. To delete a widget, click the delete (x) icon in the upper right corner. When a widget is deleted, only the widget is deleted, none of the underlying data in your Analyses are deleted or modified in any way. You can specify if you want the widget to include data from a single Analysis, multiple Analyses, or all Analyses. This is a powerful way to allow you to view vital information across multiple projects in one place. The Relyence Dashboard has an array of widgets you can add to your Dashboards. Each widget has a unique set of Properties to allow you to customize it to suit your needs. The listing below describes the available Relyence Dashboard widgets. Recent Analyses: A list of your most recently used Analyses. Click on the Analysis to re-open. Relyence Intro Video: A link to the Relyence video. Relyence Twitter Feed: Displays the Relyence Twitter feed. DFMEA Risk Matrix: A graphical risk matrix, either in 2D or 3D. Completely customizable in Properties. Overdue Recommended Actions for DFMEA: A listing of Recommended Actions that are past their due dates. RPN Breakdown for DFMEA: A pie chart of RPN values broken down by RPN Ranges set in Properties for the Analysis. Recommended Actions Complete for DFMEA: A gauge indicating the percentage of Recommended Actions that are complete. A Recommended Action is considered complete if the Actions Taken is not blank. Severity, Occurrence, Detection, or RPN Filter for DFMEA: A filtered list of FMEA items based on the filter selections you set in Properties. You can select to filter based on Severity, Occurrence, Detection, or RPN and also set the value to use for filtering. Tagged FMEA Records for DFMEA: A listing of the FMEA records that are designated as Tagged in your FMEA Worksheet. Top 10 RPN for DFMEA: A listing of the 10 failure modes with the highest RPN values. Overdue Recommended Actions for PFMEA: A listing of Recommended Actions that are past their due dates. PFMEA Risk Matrix: A graphical risk matrix, either in 2D or 3D. Completely customizable in Properties. RPN Breakdown for PFMEA: A pie chart of RPN values broken down by RPN Ranges set in Properties for the Analysis. Recommended Actions Complete for PFMEA: A gauge indicating the percentage of Recommended Actions that are complete. A Recommended Action is considered complete if the Actions Taken is not blank. Severity, Occurrence, Detection, or RPN Filter for PFMEA: A filtered list of FMEA items based on the filter selections you set in Properties. You can select to filter based on Severity, Occurrence, Detection, or RPN and also set the value to use for filtering. Tagged FMEA Records for PFMEA: A listing of the FMEA records that are designated as Tagged in your FMEA Worksheet. Top 10 RPN for PFMEA: A listing of the 10 failure modes with the highest RPN values. Catastrophic Failure Modes: A listing failure modes with a catastrophic severity. Criticality Matrix: A graphical criticality matrix, either in 2D or 3D. Completely customizable in Properties. 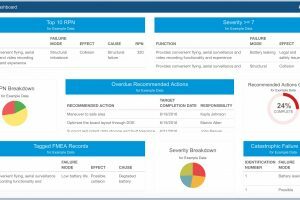 Severity Breakdown: A pie chart of Severity categories across your FMECA(s). Incidents Pending Approval: A listing of Incidents for which Approval has been requested. Incidents per Step: A series of gauges indicating the number of Incidents in each Step of the FRACAS Workflow. Open and Closed Incidents per Month: A bar chart showing the number of Open and Closed Incidents broken down by month. Open and Closed Problems per Month: A bar chart showing the number of Open and Closed Problems broken down by month. Overdue Incidents: Incidents that are overdue based on the specified due date. Overdue Problems: Problems that are overview based on the specified due date. Problems Pending Approval: A listing of Problems for which Approval has been requested. Problems per Step: A series of gauges indicating the number of Incidents in each Step of the FRACAS Workflow. Rejected Incidents: Incidents that have been rejected during the approval process. Rejected Problems: Problems that have been rejected during the approval process. Selected Incidents: A filtered list of Incidents based on customized filter settings. Selected Problems: A filtered list of Problems based on customized filter settings. Total Incidents per Month: A stacked line chart of total Incidents per Month broken down by Open and Closed Incidents. Total Problems per Month: A stacked line chart of total Problems per Month broken down by Open and Closed Incidents. Workflow Responsibility for Incidents: A list of Incidents showing the Workflow state and who is Responsible. Workflow Responsibility for Problems: A list of Problems showing the Workflow state and who is responsible. Workflow of Incidents: A funnel chart showing the Workflow progress of Incidents. Workflow of Problems: A funnel chart showing the Workflow progress of Problems. Event Types: A pie chart showing the breakdown of event types used across your fault tree(s) specified in Properties. Events with High Probability: A list of events with the highest probabilities. Fault Tree Cut Sets: A list of cut sets based on the most recent fault tree calculation. Gate Types: A pie chart showing the breakdown of gate types used across your fault tree(s) specified in Properties. Gates with High Unavailability: A list of gates with the highest unavailability values. Tagged Events: A listing of events that are designated as tagged items in your fault tree(s). Tagged Gates: A listing of gates that are designated as tagged items in your fault tree(s). Top 10 Highest Probability Events: A listing of the 10 events with the highest probability values. Top 10 Highest Unavailability Gates: A listing of the 10 gates with the highest unavailability values. Failure Rate Percentage: A pie chart showing the failure rate percentage of your Analysis Tree Subsystems. Parts Contributing 80% of Failure Rate: A bar chart showing the parts whose failure rates contribute to 80% of the overall Analysis failure rate. Subsystem Failure Rate: A bar chart of the failure rates of the subsystems in the specified Analysis. Tagged Parts: A listing of tagged parts. Feel free to test out this easy-to-use yet powerful Relyence capability!